This is the second Monday in a row that we shopped at the local Intermarche grocery store early in the morning. We caught the 8h40 bus, walked the 4 blocks to the store, finished our shopping, walked back to the bus and took the 9h20 bus back to the Intra-Muros. We only waited a couple minutes to check out and they had only 2 of their 3 lanes open today. It is cloudy and cool, with a very light breeze, and the temperature is 21C / 70F. The predicted high temperature for today is 73F or 23C. Tomorrow the forecast is for sunny and 85F / 30C. A big difference! Our friend and tutor Christine invited us to take a “La promenade du Clair de Lune – Ville de Dinard”. The whole walk is full of flowerbeds, trees and shrubs. There were colorful lights among the trees and shrubs. The entire walk is along the ocean, often without a railing or barrier at the edge. We could hear occasional singers and jazz musicians. It was a beautiful night, not too hot or cool, and we really enjoyed ourselves, even if our feet were tired. We slept great! Today was the day of “highest tides” for the month of August. It was scheduled for around 9h and 21h . At low tide, 15h30 the tide is farther out than we have seen it in a long time. We went to the beach to walk in the water in the afternoon. The water between the beach and the distant sandbar was only ankle deep. We hadn’t been on the sandbar before. The air temperature felt like 88F but the water felt great, around 70F. There were many people enjoying the water and also many sunbathing Some of the sunbathers will not be enjoying themselves tomorrow. Too much sun and not enough sun screen. Sandy on her way to wading in the water. There was an odd shaped yacht moored in the harbor, most likely waiting for the locks to open later in the day when it is high tide. An ugly super-yacht in the harbor. It was much cooler when Sandy bought our breakfast. One of our friends told us the croissants from the boulangerie on the “Grand Rue” are the best. It is also very close to our apartment, so we tried them today. We decided that they taste very good, are very buttery and flaky but not as tasty as the croissants we buy from “La Fournee la Malouine”, our usual spot. Today we had our hair cut for the 2nd time. The “coiffeur” is very kind, patient, and skilled. We love being able to rely on a hairdresser for the same cut each time. We made one more appointment with her for the 3rd week in September. Next we took the bus to the Mediatheque. Sandy had several books that were due today. After checking out her new books, we walked across the street and literally stepped right onto the bus for our return trip. Excellent timing today! We saw a Czech Republic license plate in the parking lot. On our walk back to our apartment, we walked next to the “ugly super yacht” that we had seen yesterday in the harbor. It looks like someone took a cargo ship, cut part of it away, and topped the remainder with a few levels. We noticed that they have a small cabin cruiser sitting on top of the deck. Guess they can lower the small yacht to use for fun. The name of the super yacht is the “Grand Rusalina”. Some information found online about the yacht can be found here. The “Grand Rusalina” is owned by Rustem Teregulov. Teregulov is the founder of the Development Capital Bank in Moscow. He also owns the Moscow Raceway. He purchased the yacht for 50 million dollars. He owns a bank in Moscow, but he has the boat registered in the Cayman Islands. The Cayman Islands are notorious for being a place to hide your money so it is not taxed in your country. The Grand Rusalina and its little cabin cruiser. Sandy shopped for breakfast at the “Boulangerie De La Cathedrale”. It takes her one minute longer to walk there than her usual boulangerie. She wanted us to taste the croissants from the other “boulangeries” while they were all still fresh in our minds. We shopped for meat at the Rocabey marché. The butcher’s assistant told us they would be on vacation from September 1 through September 15. A few weeks ago, Sandy sent a note to the local bus company telling them the bushes at the Rocabey bus stop are hazardous to pedestrians when they exit the bus. There wasn’t room to step off the bus without being hit in the face by thorns on the branches. Today, we noticed that the bushes had been trimmed in the last few day. There was room to step off the bus and actually walk on the sidewalk. Big improvement! This afternoon we heard a lot of noise in the street. The “pompiers” / firefighters were parked just outside our apartment with their fire truck which has an aerial work platform extension. They were practicing using the extension to rise above the apartment building next to our building. First they put stabilizers next to the front wheels, then use the jack to literally lift the fire engine truck off the ground and level it. One fireman put on rescue apparatus and climbed onto the platform. Another fireman raised him above the building roof line. It took quite a while and created an audience in the street during their practice. Interesting to watch and glad it was just a practice. Last year we watched them lower two individuals through the windows while laying on stretchers. For dinner we bought two kebab sandwiches from Chez Marcel. We ate them sitting on the stairs near by so we could listen to the “CHANTS DE MARINS AVEC LES CORSAIRES MALOUINS” perform at 20h30. The stairs allow people to sit down while listening to the singers. “Les Corsaires” are an amateur group of men that were born in the Intra-Muros and still reside here. There were about 18 singers, one accordion player, one guitar player, one clarinet, and a keyboard player. We stayed to listen for about 45 minutes then left for home, a 2 minute walk. Great free entertainment every Thursday night in July and August. Sandy sitting on the steps with the singers in the background. 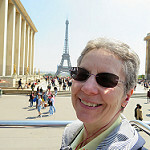 Sandy shopped for our breakfast, and then after breakfast went to the local marché for fruits and vegetables. We had tutoring with Christine today. On the walk from Christine’s house to the bus stop we saw her neighbor and talked to him for just a minute. He is very nice and very willing to talk with us. From Christine’s house we took the bus to the E. LeClerc hypermarket. We were looking for a gift for a friend, bars of soap to take to the USA, and coffee. We especially like their coffee from Brazil and it is priced at 2.23€ for the equivalent of 9 ounces. It has a wonderful flavor. The ground coffee we buy in France seems to have a better taste compared to the coffee we buy in the USA. After shopping, we had to wait 15 minutes for the bus, but it was a lovely, sunny, day with a temperature of 22C / 71F. The gas station at Leclerc was advertising a liter of gas for 2.75€. There are approximately 4 liters in a USA gallon, so the gallon price would be around $11. It was cloudy and a very pleasant temperature when Sandy bought our breakfast croissants. There were many people up walking around which is quite unusual for the time of day. Usually she sees just one or two other people walking around. School starts here on Monday September 4th so maybe everyone is trying to have one more day of vacation. The streets may be very crowded later on. We walked along the ocean on the digue. This is a cobblestone and blacktop walk between residents, hotels, and the ocean. It is always a beautiful walk and you find many benches, bicyclists, pedestrians, people with roller blades, and strollers, Today we walked both directions for a total of 4.25 miles / 6.8 kilometers. We took some photos of the milk carton we buy in France. Milk is normally, not refrigerated. The expiration date is Nov. 25th, and we bought it two days ago. You can buy an individual carton or 6 cartons that come plastic wrapped altogether. The only milk that is refrigerated is BIO which expires sooner than the other kind. It is a beautiful day. The forecast is for a high of 25C / 77F. A perfect beach day! High tide was at 11h30 today so at 13h we headed for the beach. Our goal was to walk in ankle deep water from the “Plage De L Éventail” by the castle to the about half way down the Digue. The tide was going out fast as we walked and we had to continually walk farther away from the street to stay in the water. It was wonderful! We walked for a total of 6 kilometers / 3.7 miles in just about an hour in the water. There were many sailboats out and people enjoying the day. This is a photo of the dessert Sandy bought today to have after dinner and a photo of the bag that the “boulangère” puts our croissants into each day. Very pretty!